You are likely the owner of a heavier and sparklier left hand, and it’s my job now to help you start feeling like a bride as you approach your wedding day. I specialise in natural hairstyling. 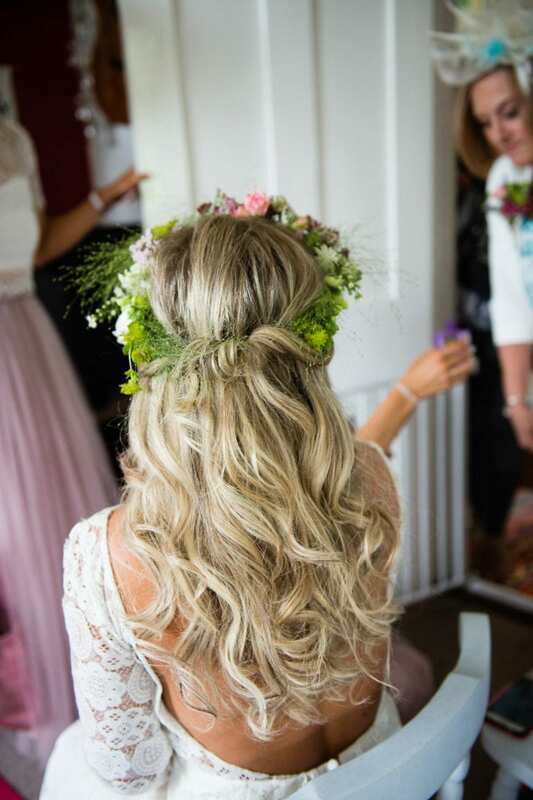 From my studio in Essex, I create bespoke bridal hair with a focus on romantic, soft looks that enhance your natural beauty. You won’t find OTT backcombing, bouffants or rock solid curls that crunch when you touch them here! We’ll work together to design a style for you and your bridal party that’s understated, elegantly natural and completely unique. Having your hair styled is a chance to feel properly pampered. 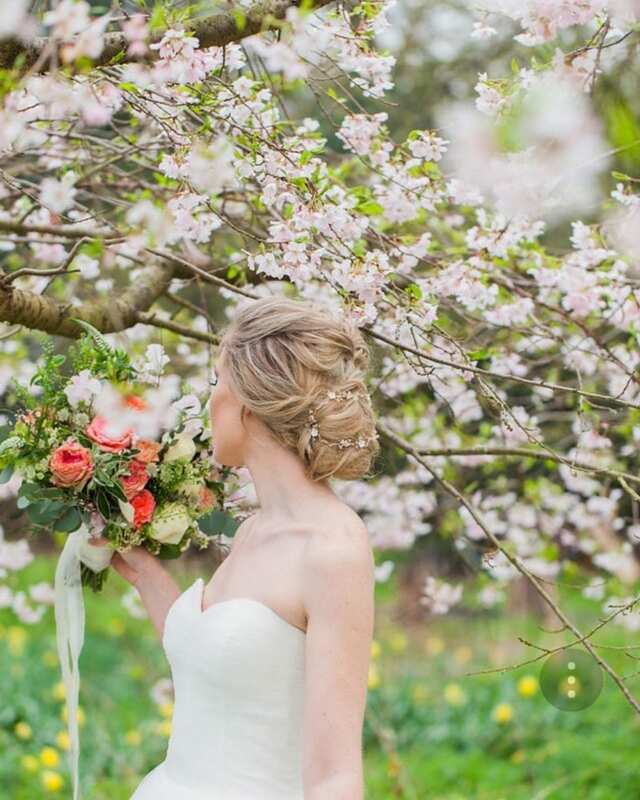 I invite you to visit my bridal studio, where there will be bubbles waiting for you on arrival! 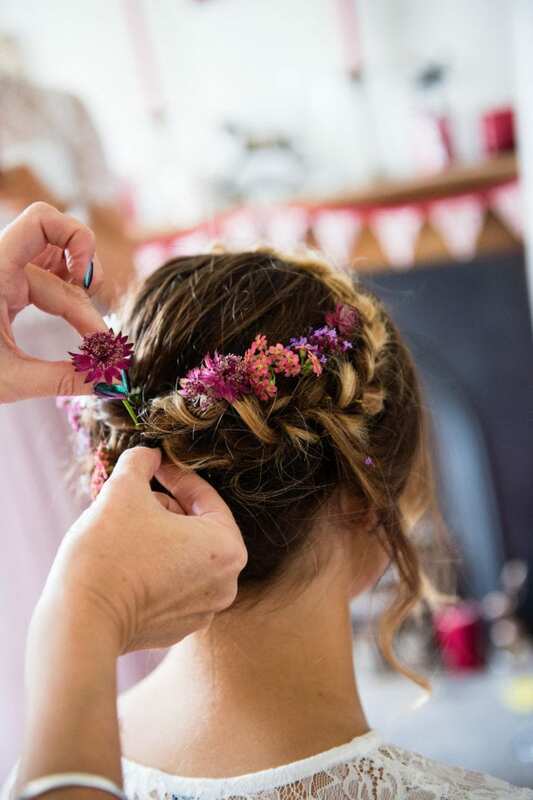 We’ll have a good old chat: discussing ideas, gathering inspiration and ultimately creating a hairstyle for you that perfectly reflects the wedding you’re planning. 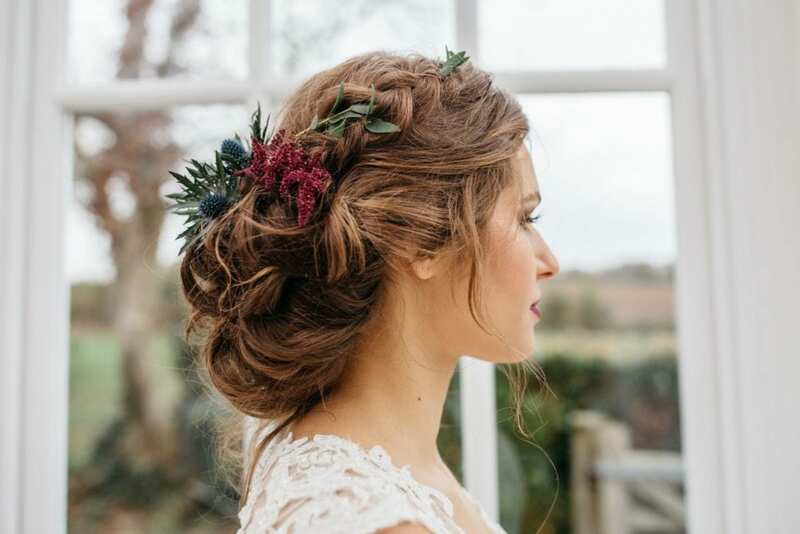 Whether you’re dreaming of a rustic barn wedding; planning boho luxury in a woodland glade; getting married in a quirky boutique hotel; hosting an all out festival wedding extravaganza, or anything in between – my experienced and versatile approach will guarantee you look and feel gorgeous on your big day. Have a look at my portfolio and services page, and why not get in touch for an initial consultation? I can’t wait to hear about your wedding plans. Jennie was absolutely amazing from start to finish. I loved so many styles, and Jennie helped narrow it down and create exactly what I wanted for my wedding. The products she uses are also great. Jennie isn’t a stylist that just piles on masses of hairspray, she uses top quality products to create natural finishes. I felt completely comfortable going into my wedding day after my trial, as I knew I was in capable hands. Jennie is also such a lovely person, anyone would be lucky to have her bright and bubbly self with them getting ready for their big day. Thank you Jennie, you’re a star! 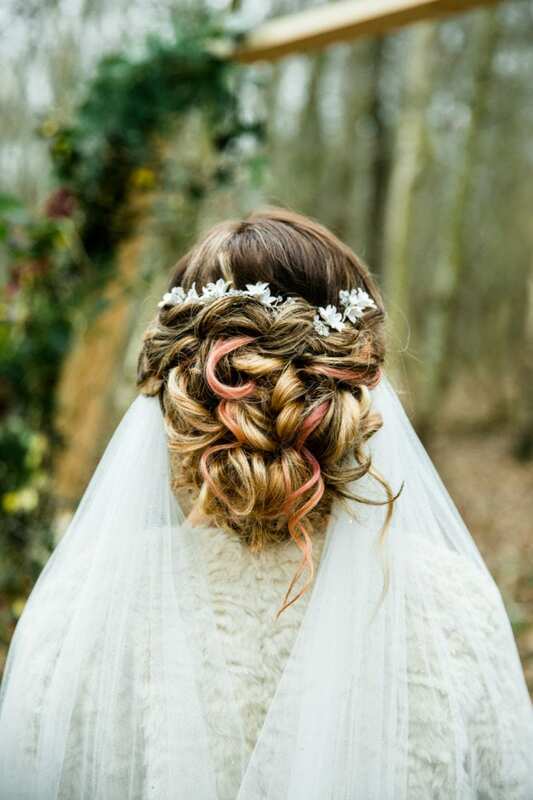 Thanks so much for all you did on my wedding day.You made my hair look more amazing than I could ever dreamt,I honestly felt like a princess! 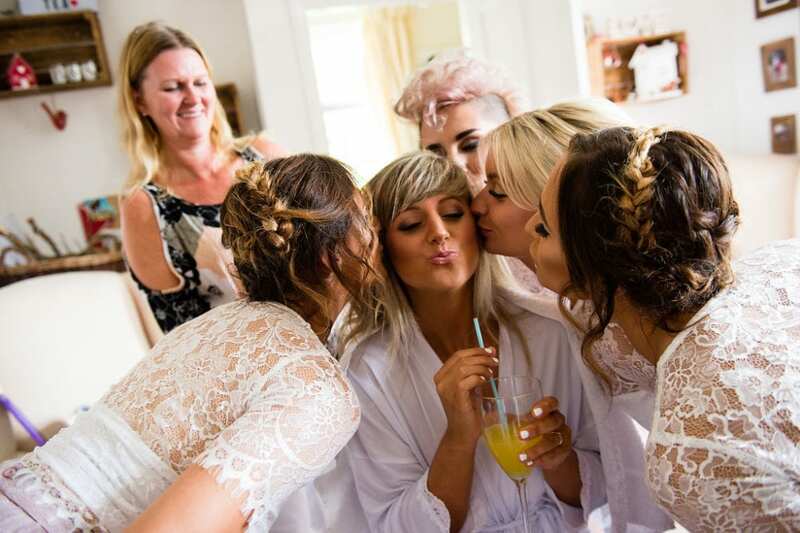 I loved everything you did with my bridesmaids hair too, it all fitted the style of the day so perfectly.Not only are you incredibly talented with hair but such a lovely lady too,we all loved having you there whilst we got ready.I wish I could do it all again . We had an amazing day and all because of you keeping me calm and making us look beautiful. Firstly, we just wanted to say a massive massive thank you for mine and my bridesmaids hair, you did the most amazing job! We were all so pleased with them! I couldn’t have picked a better hair stylist.Thank you so so much.Not only are you amazing at what you do, your also a beautiful person inside and out- made us all feel so comfortable. Thank you so much for our beautiful go to hair-dos.We love how fun,friendly and experienced you are, – we are so lucky!